Raise your hand if you like to save money on groceries! 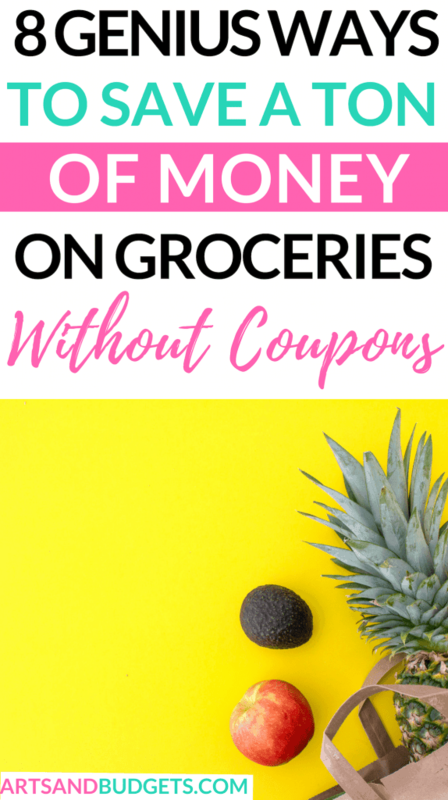 I know I do so I decided to explore different hacks and tips to save money on groceries each month for my family. I don’t know about you but my family loves to eat and buying food totally adds up each week. 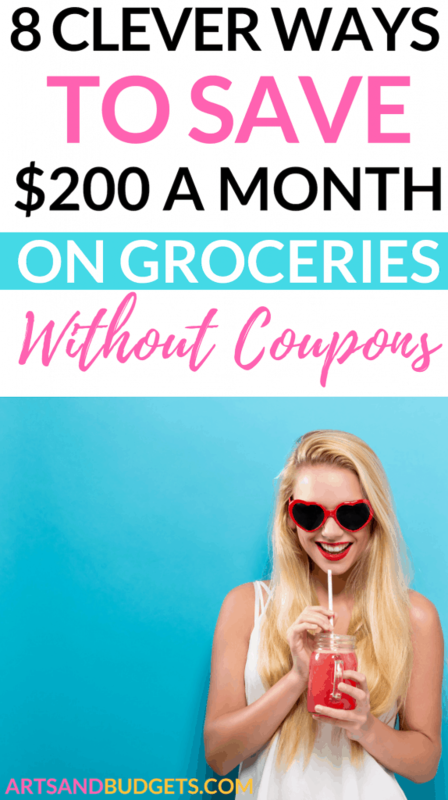 So, I decided to dive in and find the best ways to save money on groceries each month. While searching for different hacks online I came across some amazing ways a person can save on food each month to stay on budget. So this post will share my top tips on how to save money each month on items that you may buy monthly. One of the top ways to ensure that you save money before you hit the grocery store is by writing out a list of items that you need from the store beforehand. Normally before I go to any store I go to Pinterest and search for keywords such as “Dinner Ideas”, “Healthy Dinner recipes” to get some ideas of what I need from the store. I go shopping every week so I draft up a weekly meal plan and only get the items needed for the meals for the week. This has helped me plan out my weekly meals and it has also helped me save a ton of money when I go to the store. Meal Planning: Which brings me to my next area of focus, meal planning. Because I plan out my meals a week ahead of time it helps me stay organized, save money and stay ahead of the game. If you are looking to save money and save time look into setting up a weekly or monthly meal plan. Write out a list and take it to the store with you: After I get my meal ideas from Pinterest I make a list of the items needed and take it with me to the store. I love doing this because I know exactly what I need from the store as soon I get there. This hack helps me not wander around the store for hours looking for stuff and getting things I really don’t need. This not only helps me save money but it also helps me save a ton of time. Using Cashback apps can help you save a ton of groceries. What’s cool about some cashback apps is that you can earn cash on everyday purchases that you already buy. My favorite cashback apps are Ibotta and Ebates. Ibotta: You can earn money from your groceries with this app which is uber amazing to me! With this app, Before you go shopping, you can unlock cash rewards on great products by finishing tasks on the app. Then when you buy the products at the store you can upload your receipt and get cash back. What’s cool about Ibotta is that you can get real cash back and have sent directly to your PayPal account from your purchases. The company rocks because it partners with leading brand retailers to offer offers on groceries, electronics, clothes and more. Check out Ibotta here! Ebates: Ebates is super awesome if you are looking to earn cash back when you shop. When you shop online at your favorite stores through their site you earn cash back from your purchases and then receive a check. How cool is that? Sounds pretty cool to me! I know a TON of people who receive cash back from shopping through Ebates. Another awesome way to save a ton of money is by searching for sales. How I search for sales is by first going directly to the website of the stores that I went to check out. 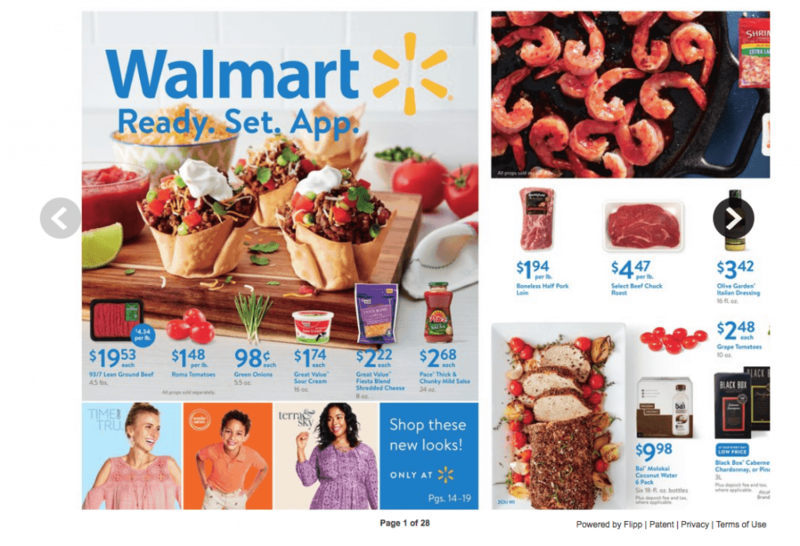 For example, if I decide to shop at Walmart for my groceries I would go directly to their website and search the “Weekly Ads” section, as seen below. By looking at their weekly ad section it helps give me an idea of what’s on sale and what to look for before I even get to the store. Another option is to grab a department store paper right when you walk in the store. The cool thing about getting an actual paper from the store is that you can walk around with it while you shop to catch the deals in action. Places like Costo’s and Sam’s Club let you buy meats in bulk. When I had my baby shower for my son, the store Sam’s Club was my best friend. My husband and I were able to buy a TON of meat on sale and save a lot of money for our baby shower on food. So, make sure to check out your local Costo’s or Sam’s Club to see which deals you can get on meat in bulk. If you are open to it you can check out stores that offer food at a lower price such as Aldi and Walmart. For the most part, I get most of my fruit from Aldi because they have a great selection and you can get it for half the price you would pay for it at let say Jewel’s. Walmart is also a great store to buy fruit and other items from. Walmart also has an app that let you earn cash back from your purchases at any Walmart. I highly recommend it if you are looking to save money on your purchases from Walmart. Check it out the Walmart here! Every store has a “store” brand that’s a little bit cheaper. For example, Walmart has a brand called “Great Value”. I have totally brought the great value brand and have saved a ton of money on food items such as can goods and other products. At Target their generic store brand is called “Up & Up” I absolutely love the Up and Up brand and you can literally find any product with the Up and Up label in Target and pay a little less for the item. This is a really cool hack that I recently just learned about. A lot of times many food items will be marked from the day before early in the morning in grocery stores. Different Departments will mark down items (normally meats) that are getting close to their “sell by” date. I have gotten a lot of deals using this hack on meats. So, check out your local grocery store early in the morning and see if any items are marked down from the day before. You can install the app for free super fast. Honey will find working coupon codes and the best deals online. The best code is automatically applied to your shopping cart on the website you are buying from. You can save at thousands of stores that you are already buying from such as Walmart or Amazon. Have you ever heard that if you go meatless for a few weeks or months that you can save a lot of money? Going meatless has been a little bit harder for me to do because of my love of chicken but I have noticed that buying chicken meat can be expensive. The average price for the bags of chicken that I buy is around $ 10 to $20 each. So on average, I spend around $40 to $60 bucks a month on buying chicken and at just recently it has been a little higher because I have switched to buying organic chicken. To my surprise, their findings were that a person that doesn’t eat meat can save an estimated $565 a year. Whoa! That’s a plane ticket to California for me! But, seriously, going meatless can actually help a person put more money into their saving account which in return can help them spend way less on groceries each month. This one has been a game changer for me. I noticed that every time I go to the store and don’t bring cash I tend to spend way more on my card. I remember one time I went to the store I spend amount $200 on food and didn’t realize it until I was in the checkout. So this hacks has helped me a ton. So before I do my weekly grocery shopping I make sure to have cash and try not to spend over the amount in my budget for food each week. Currently, my family of 4 has a budget of $70 per week on groceries and sometimes we only spend $50 depending on the items that we have to buy. So, try to go to the grocery store with only cash to stay on your budget. HAWO: With HAWO you can get paid up to $22 an hr to teach children that live in China. Don’t worry, you do not need to know any foreign language and their team also create all the lesson plans for you! #Score! Also, you can do your online teaching right from your own home. So, if you have a Bachelor degree you can totally apply for HAWO and start making full-time income this month. I have a lot of friends who teach from home and love it! Check out HAWO by clicking here. We love Costco. I can’t get out of there for under $100 but I’m set for more than a month! Omgosh! Costco is one of my favorite places to shop. I love these hacks, especially about going early in the morning! Great tips. Thanks!! I love going in the morning. This is a really comprehensive list of money saving hacks! I’ve never heard of Honey before, it sounds great. Thanks so much, Helen! 🙂 Thanks for stopping by! I’ll have to try some of these. I always make a list and a meal plan but I always have issues with trying to buy healthy since it’s so much more expensive than everything else. Great tips! I know I definitely spend less when I plan out my meals and make a grocery list. Thanks for sharing! Thanks for all the tips! Good idea about shopping in the morning for deals! These are such great tips! My biggest tip is to not shop with men ? Whenever I shop with Alan we spend a gazillion times more because he wants ALL THE THINGS haha! Haha! That’s so funny, Valencia ! :) Thanks for stopping by! Mostly i am looking for the deals to shop groceries , thanks for your cool tips to get shop early in the morning. I agree here with these wonderful tips! I follow almost all the tips, but i do not buy in bulk.